It’s not true. It’s not possible to hack your computer by making you accept a friend request on Facebook. Please find more details at the link below. 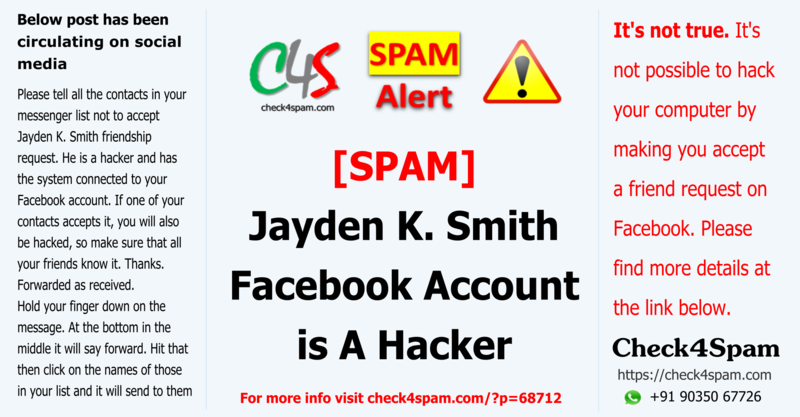 Please tell all the contacts in your messenger list not to accept Jayden K. Smith friendship request. He is a hacker and has the system connected to your Facebook account. If one of your contacts accepts it, you will also be hacked, so make sure that all your friends know it. Thanks. Forwarded as received. It’s not true. It’s similar to the earlier Anwar Jitou Is A Hacker post which was viral. It’s not possible to hack your computer by making you accept a friend request on Facebook.